The pre and post sales assistance represents for IMPER a fundamental moment of the Customer Oriented Service. The analysis of the project and the identification of the best solutions to solve the most complex problems of waterproofing and after the realization of the works by highly specialized operators are important for the company. At the Training Center of Mappano courses are held periodically to specialize the operators in the application of the big range of IMPER ITALIA products. The courses include training on the most advanced and technological waterproofing systems as well as the use of the most modern laying and welding equipment. The training and refresher courses proposed in 2016 are carried out at our Training Center at the headquarters of Mappano (Turin, Italy); the duration varies from 1 to 2 days, depending on the level of the course itself. The Training and Upgrade Courses are designed for all our installers motivated to expand their knowledge on our products and new laying techniques. 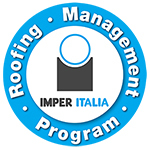 Technological Partner for Clients, Enterprises and Designers IMPER ITALIA with the program called ROOFING MANAGEMENT PROGRAM intends to offer a global assistance in the realization of large projects by providing customized services and products / systems specific to individual projects (tailor made solutions).